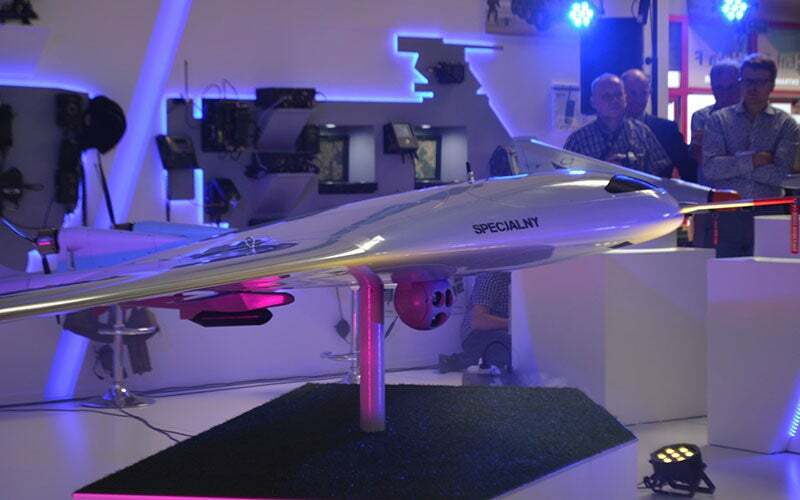 The Manta UAV’s VTOL variant was launched at the MSPO 2015. Image courtesy of WB Electronics S.A. The Manta UAV is capable of carrying a Warmate micro C-UAS. Image courtesy of WB Electronics S.A. The Manta aerial vehicle features vertical take-off and landing capability. Image courtesy of WB Electronics S.A.
A vertical take-off and landing (VTOL) variant of the Manta unmanned aerial vehicle (UAV) was unveiled at the 23rd International Defence Industry Exhibition (MSPO) held in Kielce, Poland, in September 2015. It is developed by Polish weapons exporter WB Electronics, in cooperation with Polish unmanned air vehicle manufacturer Flytronic. The UAV is designed for use by the armed forces in missions such as intelligence, surveillance and reconnaissance (ISR), observation, and target acquisition. The tactical UAV can be armed with a gliding variant of the Warmate micro combat unmanned aircraft system (C-UAS). The Manta tactical UAV system is back-packable and consists of a UAV, payloads, integrated digital data link, and a ground control station. The UAV is made of composite materials and is capable of both conventional and vertical take-off and landing. The VTOL capability allows operation in isolated areas, while the retractable tricycle landing gear facilitates safe take-off and landing. Empty weight of the UAV is 50kg, and the fuselage length and wing spans are 3.3m and 6.6m respectively. The drone’s maximum take-off weight in standard configuration is 140kg, twice that of the VTOL configuration. The UAV can be remotely controlled or can fly autonomously. In the autonomous mode, an autopilot directs the drone towards its designated waypoints by following the pre-programmed flight path. The waypoints can be modified in real-time during the flight. The UAV incorporates two ducted fan motors, enclosed with covers in the main wings. The covers open automatically when the VTOL mode is activated and close when the aircraft flight is transitioned from vertical to horizontal mode. The unmanned aerial vehicle can carry a variety of payloads weighing between 15kg and 35kg. A payload pod mounted under the fuselage houses an electro-optical (EO) / infrared (IR) optoelectronic sensor for the purpose of collecting intelligence and reconnaissance data both during day and at night. "The UAV is designed for use by the armed forces in missions such as intelligence, surveillance and reconnaissance (ISR), observation, and target acquisition." The communication intelligence (COMINT) / electronic intelligence (ELINT) radio and electronic reconnaissance payloads are used to gather information from electronic and communication systems. The Manta UAV’s sensor suite also includes a rangefinder, laser target designator, synthetic aperture radar (SAR), marine radar, LiDAR, automatic identification system (AIS), normalised difference vegetation index (NDVI), and CBRN detection devices. The SAR and marine radars provide detailed imagery of the surface, while the NDVI determines remote sensing measurements. The onboard reliable data link transmits real-time sensor data to the ground station and receives mission commands from the remote server. The operator at the ground performs mission planning, flight control and monitoring of the UAV using a touch-screen laptop. Vertical lift for the drone is provided by two ducted fans and two propellers, mounted in pusher configuration. A hybrid propulsion system, comprising an engine and lithium-ion batteries, supplies power for both ducted fans and propellers. The UAV can fly up to a service ceiling of 16,400ft and can stay airborne for up to six hours in the VTOL mode, while its endurance in the standard mode is 20 hours. The UAV can transmit data up to a range of 170km. This project forms part of our recent analysis and forecasts of the global unmanned aerial vehicles (UAV) market available from our business information platform Strategic Defence Intelligence. For more information click here or contact us: EMEA: +44 20 7936 6783; Americas: +1 415 439 4914; Asia Pacific: +61 2 9947 9709 or via email. Across air, land and sea, SELEX ES delivers mission critical systems for situational awareness, self-protection and surveillance to customers around the world.